My plans for the first of advent were somehow different, but as I caught a mean cold I have to spent the day on the sofa instead of baking something delicious for Christmas. The only good thing is that I had enough time to browse through the unpublished recipes. 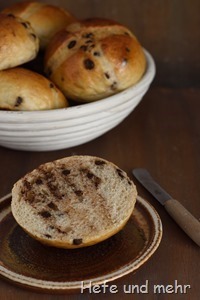 I rediscovered the chocolate panettone I bake last Christmas but never published the recipe. And so I used the time to publish it now, nearly a year later. 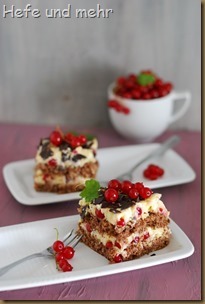 It is a delicious twist on the classic recipe which combines the flavours of chocolate and citrus fruits. 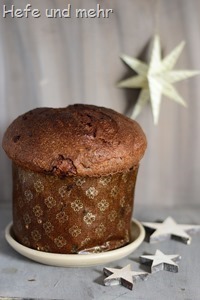 And just like the “normal” panettone this chocolate version is baked with sweet starter only which adds a delicious deepness to its flavour. 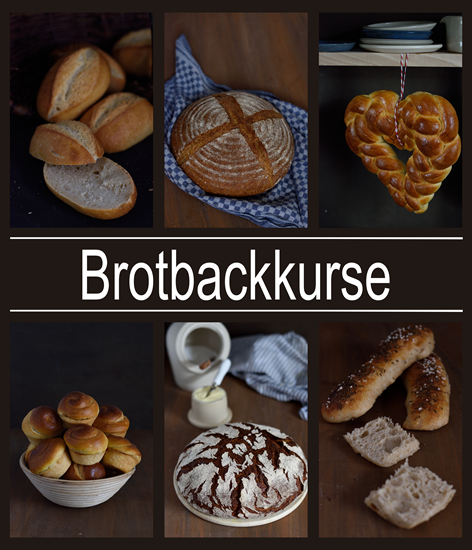 And with this last year’s delicious treat in my mind I begin to dream about what to bake for Christmas this year…. 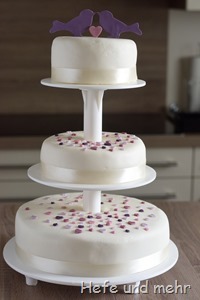 Some month ago the sister of my dearest and me agreed to bake a wedding cake for some friends of her. And so we spent a lot of time on pinterest, collecting ideas and inspiration. Slowly a plan for the decoration emerged and finally we had a plan for the cakes as well: Punch torte, Nussnougat-Quark-Cake and Sacher Torte would be the perfect cakes. We baked some tiny test cakes for the bride and the groom, they tried them and liked them, too. 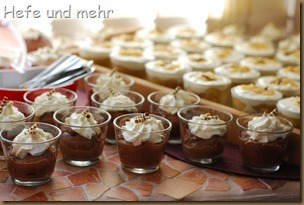 Especially the punch torte was a favourite. And as we changed this recipe quite a lot it deserved its own recipe. Before we look back at the Blog year 2015 tomorrow, there is one last Christmas recipe I want to share with you. The little chocolate rounds are a delicious addition for the cookie plate and are a very nice little Present for everyone with a sweet tooth. And as they are easy to make they are a good last minute present as well! For a good, shiny surface it is important to temper the chocolate. I do this by melting part of the chocolate, then adding the remaining part and then carefully heating it up to 30°C. This work best with a digital thermometer! For the topping you can use what ever you like: dried fruits, nuts, candid fruits. I for myself prefer highly the variant with chopped (homemade) candid orange peel, as I like the contrast of sweet chocolate and the slightly bitter, fruity flavour of the Orange! Upps, there was for a short time a blog post online which should be the last of the year. 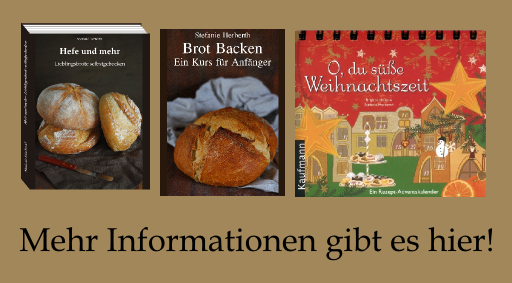 But there are still some recipes from my Christmas Cookie Plate waiting form which I want to tell you before the new year starts. One of these are dark Nogat, Turrón de Chocolate. 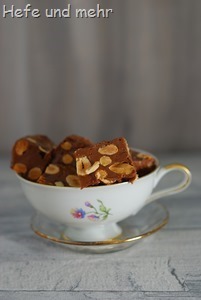 It is similar to the white nougat, but some additional chocolate is folded in before adding the nuts. Turrón making is a exercise in multi tasking, and it makes sense to think about the process before starting. You need to have ready at the same time point melted chocolate, whipped egg white and the boiling sugar syrup at the right temperature. It helps to have kitchen machine for whipping the egg white or a second person who is willing to help. A sugar thermometer is a muss for this recipe as well, as getting the right temperature is essential for the consistence of the final product. To cold syrup will result in a not setting turròn while to hot syrup will starts to caramelize. It is a challanging recipe but the flavour is worth every trouble! This year is a great year for berries. In my parents garden the red currants bushes bent down under the load of ripe berries. Two weeks ago I picked enough berries to cook enough red currant jelly for the coming year and it you could hardly see that I take any fruits. And so I picked another 2 kilogramm berries in betweeen two thunderstorms last Friday afternoon. The most of the currants are cleaned and froozen, the rest I used for baking a cake. I found the recipe at Chili & Ciabatta, but due to the leftover in my baking drawer I changed the dough already a lot, adding grounded almonds and chocolate. And the for the vanilla creme I go for a different recipe because I do not use gelatine. And even if the recipe is a different one in the end, the cake tastes fantastic. A sweet vanillacreme is balanced by the tarte red currants and with chocolate you can never do wronge! When I baked the little Colombinas about five years ago I was already searching for the traditional paper mold for Colomba pasquale. But I had no luck finding one neither in the “real word” nor in german onlineshops. And so I finally give in and bought a silicon mold, ignoring my dislike of this kind of baking molds. And the mold was delivered just in time, so the only thing I had to was to refresh my sweet starter and start baking. Raisins and candid orange peel would make my beloved one rather unhappy, so I choose semisweet chocolate drops and chopped candid almonds instead. The fits well with my first colomba memory, when some years ago a former colleague brought back a big, chocolate filled colomba after visiting her parents in Italy. 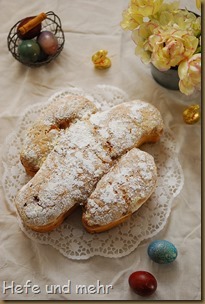 The dough for the dove is similar to my pandoro recipe, but this time I kneaded the butter into the dough. The dough was easy in handling and after baking I was able to unmold the colomba without any problems, much to my relief. After cooling down we cut the dove and the first bite of it was pure delight. The crumb could be torn into long strands and was as light as a feather, and the combination of chocolate and candied almonds is great, too! This colomba is a real dream dove! 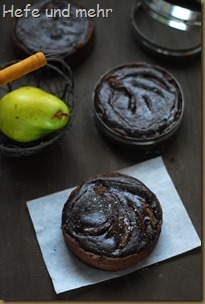 A combination which is unbeatable for me is semisweet chocolate and pear. And when I have pears in the kitchen witch has to be used quickly because they are already very ripe, I tend to always to come back to this combination. And when I was left with one and half pear after cooking the Apple Pear Jelly I started to knead a pastry dough without much thinking. While the dough rested in the fridge I cooked the pears and whipped up a chocolate filling. 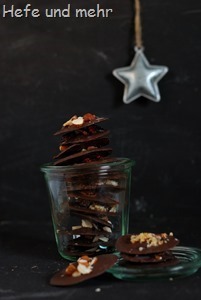 The filling is flavoured with a hint of cinnamon and tonka bean which adds some depth to the chocolate. I baked the tarteletts in rings I bought in France last year, but a regular tarte form will do as well. And here we go with the second part of the desserts I made for my nephews christening! And because serving something with chocolate is never a bad idea I decided to make a creamy chocolate custard topped with some whipped cream. And as expected it was a hit with adults and with the little ones as well! Some recipes are just what they seemed to be. 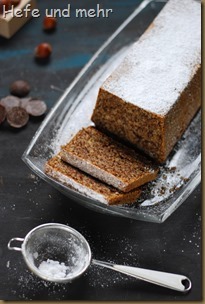 Like the “simple and delicious nut cake” recipe which I found on Alex’ Blog Foto e Fornelli. The picture was very tempting and I made a mental note to try the recipe as soon as possible. And when my mum called to ask if we want to meet spontaneously at the weekend, I had THE excuse to bake the cake. It was a good idea to make this cake because everyone liked it very: moist, nutty and chocolaty is a mixture that never fails! A new favourite cake of our family!